In recent years, a tremendous success in wavelet image coding has been achieved. 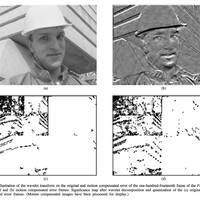 It is mainly attributed to innovative strategies for data organization and representation of wavelet-transformed images. However, there have been only a few successful attempts in wavelet video coding. The most successful is perhaps Sarnoff Corp.’s zerotree entropy (ZTE) video coder. In this paper, a novel hybrid wavelet video coding algorithm termed video significance-linked connected component analysis (VSLCCA) is developed for very low bit-rate applications. There also has been empirical evidence that wavelet transform com- bined with those innovative data organization and representation strategies can be an invaluable asset in very low bit-rate video coding as long as motion compensated error frames are ensured to be free of blocking effect or coherent. In the proposed VSLCCA codec, first, fine-tuned motion es- timation based on the H.263 Recommendation is developed to reduce temporal redundancy, and exhaustive overlapped block motion compensation is utilized to ensure coherency in motion compensated error frames. Second, wavelet transform is applied to each coherent motion compensated error frame to attain global energy compaction. Third, significant fields of wavelet- transformed error frames are organized and represented as significance-linked connected components so that both the within- subband clustering and the cross-scale dependency are exploited. Last, the horizontal and vertical components of motion vectors are encoded separately using adaptive arithmetic coding while significant wavelet coefficients are encoded in bit-plane order by using high order Markov source modeling and adaptive arithmetic coding. Experimental results on eight standard MPEG-4 test sequences show that for intraframe coding, on average the proposed codec exceeds H.263 and ZTE in peak signal-to-noise ratio by as much as 2.07 and 1.38 dB at 28 kbits, respectively. For entire sequence coding, VSLCCA is superior to H.263 and ZTE by 0.35 and 0.71 dB on average, respectively. J. Vass, B. B. Chai, K. Palaniappan, and S. Zhuang. Significance-linked connected component analysis for very low bit-rate wavelet video coding. IEEE Trans. 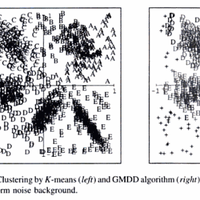 Circuits and Systems for Video Technology, volume 9, issue 4, pages 630--647, June 1999.
keywords = "classification, data mining, machine learning"
Three-dimensional significance-linked connected component analysis (3D-SLCCA) is pro- posed for compression of volumetric magnetic reso- nance imaging (MRI) data. Due to relatively low inter-slice correlation and high noise level of MRI, 3D- SLCCA treats two MRI slices as a processing unit. By using the Haar wavelet, the temporal lowpass and temporal highpass subbands are obtained as the sum and difference of two consecutive slices, respectively. Then dyadic spatial wavelet decomposition is applied on each temporal subband separately, and significant wavelet coefficients are organized and represented by using the SLCCA technique. The proposed 3D-SLCCA codec provides high compression efficiency, progressive volume representation, low complexity, and transmis- sion error resilience. These desirable features make 3D- SLCCA especially well suited for use within a clinical picture archiving and communication system (PACS) and telemedicine. keywords = "image compression, image analysis, video coding, biomedical"
J. Vass, J. Yao, K. Palaniappan, and X. Zhuang. 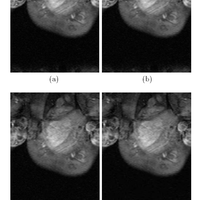 Three dimensional wavelet coding of magnetic resonance images. IASTED Computer Graphics and Imaging, pages 128--133, 1999.